Crate Training A Puppy - A Postive Method For Channeling Your Dog's Behavior! Do you have a new puppy that needs to be house trained? Are you looking for a low stress way to handle this? Then you'll be glad to know that crate training a puppy is a method that will meet your needs in more ways than one. And it's the approach most widely recommended by professional trainers simply because the process has proven to be successful in getting the job done in the shortest amount of time! Here's something else - crate training almost magically modifies the other areas of dog behavior that you want to correct. And contrary to what some people may think, the end result is a happier pet that feels more secure in his world. One of the keys to successfully crate training a puppy is to start early so that as a puppy matures the crate will take on the significance of a den and become a natural haven in his environment. While the crate will mainly be used during the early months of a pup's life for house training and to keep him safe from investigating potential hazards around the house, it will later prove itself invaluable for other purposes, as we shall see. But the main thing to keep in mind, is that a puppy will have a much easier time growing up in a loving home with owners who take time to teach him the social skills he needs. Learning the rules benefits a puppy by preventing the endless scolding that results when he has to learn on his own through trial and error. Besides which, it's just plain unfair to give a dog free rein in the house and not expect trouble! 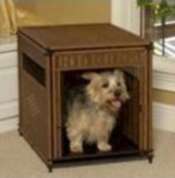 Once you see that your pup has reached the stage where he totally accepts the crate as his own special place and happily uses it, you will soon come to realize that it has many other convenient uses. While we certainly do not advocate that a dog be left in a crate for prolonged periods, there are times when its use will be advantageous to both you and your pet. These are occasions when stress might be a factor, such as car travel, visits to the vet or groomer, overnight medical treatment etc. Plus it can be used as part of a process to help pets overcome separation anxiety. Also, if you ever need to board your dog, or transport him after an injury, he will feel safer if he has become accustomed to being in a confined space. Well first you have to get the crate - and you will find that we have taken this into consideration by providing a wide selection of dog crates here, both wire and plastic. My suggestion is that you get an adjustable type of crate that can be expanded as your puppy grows. For a fully grown dog, select one with sufficient room for him to stand up, lie down and turn around in. Tip: wire crates are good for dogs that like to chew everything! Plastic is needed to meet airline travel requirements. Include a nice comfy bed inside the crate. Since dogs and puppies enjoy the nearness of you and have an incredible sense of smell, a bed that reminds them of you will be ever so comforting to them. See how to make this simple and easy kind of dog bed here. Leaving the door open as an invitation, then closing it after putting a treat inside. Make that dog bed we talked about earlier - your scent will be reassuring. Or, in its place perhaps an old sweat shirt of yours. Give your puppy a treat or toy when he chooses to go in the crate along with substantial praise. Keep the crate in the main part of the house where he can see what's going on. At mealtimes, place his food bowl near the crate. Sometimes, if pets show prolonged resistance to the crate, food can be placed in it for a while. When your puppy first starts using the crate, leave the door open until you feel he has accepted this new environment, then start closing it for short periods of time. Let him out fairly frequently to begin with to ensure he doesn't become fearful - remember you want him to think of this space as a safe haven. It is very important that the crate is never used as punishment. To do so, will just sabotage its use for many other convenient purposes. Time in the crate should not be excessive. For example, it would not be logical to expect a dog to cross its legs for five hours waiting to empty its bladder. Plus, long periods or confinement are just not fair to a pet. 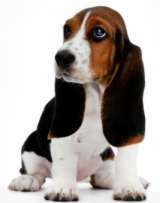 Dogs are naturally clean animals and do not like to soil their dens or sleeping quarters. In the wild, a dog or puppy would leave the den to relieve itself outside. In your home, the crate becomes your puppy's den where he will spend short amounts of time between other activities: mealtimes, playtimes and visits outside to eliminate. Gradually, the time in the crate can be increased as he gains better bladder control. But, during training, its inevitable that accidents will happen and when they do, check out our advice and tips for dog urine removal. Lastly, while you are crate training a puppy or older dog, make sure that toys left in the crate are ones you know to be safe and be sure to remove any neckware that might catch on the crate fixtures. So that about wraps it up except to say hang in there and stay the course. The effort you put in now will pay off for a long time. Good luck.